The prevailing industry-standard data rate of just 64 kbits-per-second was slipping far behind the broadband connections enterprise customers enjoy on the ground. Additionally, business jet customers are typically technology advocates and early adopters: they need good connections to the home office when they travel and demand the cutting edge of technology in their business and leisure pursuits. To fill such needs, the SKYLink BroadbandSM Service was launched, a revolutionary in-flight broadband service from ARINC DirectSM. This high-speed satellite connection can change a corporate aircraft into an office in the sky. SKYLink Broadband allows business aviation passengers to remain connected  at speeds more than 6x faster than a cable modem  even at 30,000 feet. Passengers can download data to the aircraft at up to 3.5 Mbit/s, while sending data from the plane at 128 kbit/s. The service comes at an all you can eat fixed price and every link is secure, as well  each aircraft is on its own Virtual Private Network (VPN) within the system. 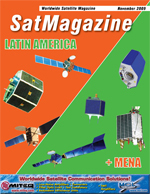 SES Americom is partnering with ARINC to provide SKYLink, supplying satellite transponders and funding for the project. To make the service a technical and business success, ARINC turned to ViaSat satellite networking technology. ViaSat is supplying a complete airborne broadband terminal and ground system, available both as a retrofit for larger business aircraft and as original equipment in new corporate jets, the first being GulfStream Aerospace. The airborne system builds on ViaSat ArcLight CDMA broadband VSAT technology. ArcLight satellite communications technology introduces new breakthroughs in satellite network waveforms, frequency reuse, and return channel technology. The result is efficiency, lower costs, and added data security. A key hurdle in developing SKYLink was placing an antenna onboard that could receive broadband data. Anything added to an aircraft must always be as small and as lightweight as possible. The CRMA spread spectrum waveform is the answer, as the lower power requirements open up applications that need smaller satellite antenna sizes, as opposed to standard VSATs. The antenna used for the SKYLink mobile broadband system is less than 24 inches in diameter. The SKYLink installation includes a tail-mounted antenna and a satellite transceiver on the aircraft. The Ku-band satellite network is expanding to offer end-to-end, seamless roaming extending over most popular air routes. Global coverage is expected to be in place by the end of 2010. ARINC estimates that there are 1,200 larger business jets in the U.S. that can accommodate the service, and 2,000 such jets worldwide. Other mobile applications could follow, as well. ARINC Incorporated is a world leader in transportation communications and systems engineering. The company develops and operates communications and information processing systems and provides systems engineering and integration solutions to five key industries: airports, aviation, defense, government, and surface transportation. Founded to provide reliable and efficient radio communications for the airlines, ARINC is headquartered in Annapolis, Maryland, with more than 3,000 employees worldwide.